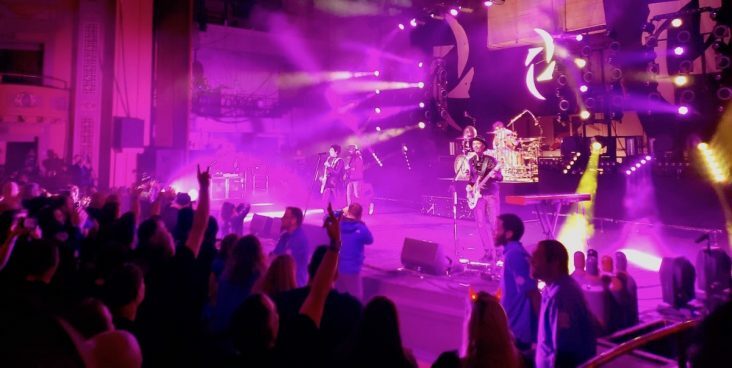 The band “Halestorm” performs in the 2,300-seat theater at the Cleveland Masonic Temple (photo courtesy of Beaty Capital Group). Fort Smith-based Beaty Capital Group, owner of TempleLive in downtown Fort Smith, announced Tuesday (Jan. 29) it is completing the first phase of an estimated $8 million, two-phase renovation of the 200,000-square-foot Masonic Temple in Cleveland, Ohio. Although under renovation, the 2,300-seat theater at the iconic seven-story building in what is called “MidTown” Cleveland – just a few blocks from the Rock and Roll Hall of Fame – for the past year has been home to numerous concerts and shows. Working with Live Nation, a club and theater promoter connected to more than 100 venues in the U.S., including the Walmart Arkansas Music Pavilion (AMP) in Rogers, the Cleveland temple has 19 shows booked through May 2019. Live Nation is also contracted to book shows for TempleLive in Fort Smith. Beaty Capital owner Lance Beaty told Talk Business & Politics the first two phases of the Cleveland renovation work will cost around $8 million, with a much larger third phase in development with costs yet unknown. The Masonic Temple building was purchased by Beaty Capital in March 2017. At the time, Beaty said they might potentially invest $18 million in upgrades and renovations. The Cleveland temple was designed by architects Hubbell and Benes, a prominent Cleveland architecture firm of the period, according to Beaty Capital. Construction began on the Masonic Auditorium in 1918 and was built by the Scottish Rite bodies and the Shrine (composed of 32nd-degree Scottish Rite Masons or Knights Templar). Since opening in 1921, the building has been in continuous operations and served as the central facility for Cleveland area Masons. Beaty acquired the historic 53,000-square-foot Masonic Temple in downtown Fort Smith in November 2014 in a $2.5 million deal. The three-story building at 200 N. 11th St. was built in 1928 and has numerous meeting rooms and a theatre capable of seating 900. It reopened as TempleLive in August 2017 after around $5 million in renovations. 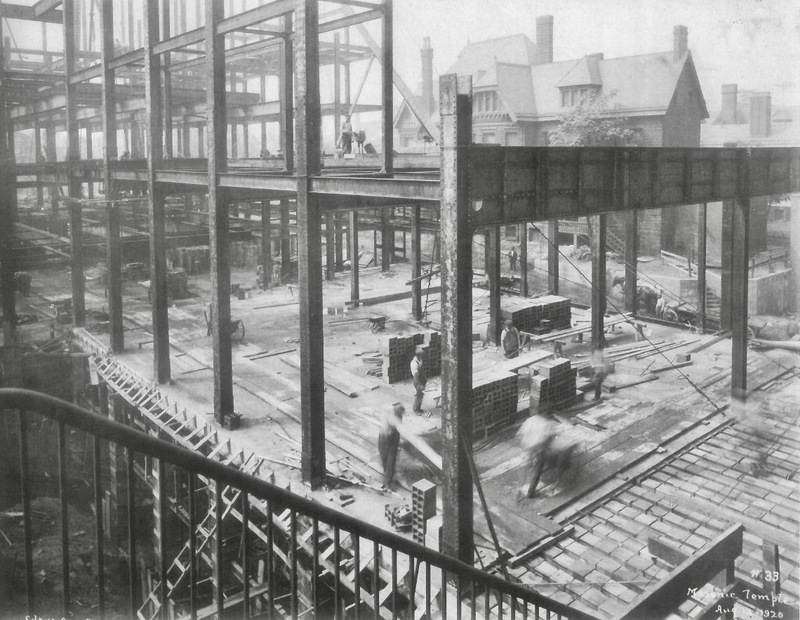 Image dated 1921 from Beaty Capital Group of work on the Cleveland Masonic Temple. Beaty said Temple operations in Cleveland and Fort Smith employ a combined 100 people, “but that changes often based on the shows and other activities we have going on” at the two locations. Mike Brown, vice president-entertainment/clubs and theaters for Beaty Capital, said the first and second phase of work is focused on stabilizing the building and making improvements necessary for more public use options. Jeff Epstein, executive director of MidTown Clevelend Inc., said the ongoing Temple work adds to the “live-work-play” growth in the district. “The investment and programming of this historic venue adds to our burgeoning entertainment district and the growing vibrancy of MidTown as a complete live-work-play neighborhood. We are thrilled that this incredible complex is being restored for new generations of concertgoers to enjoy and look forward to working with TempleLive Cleveland and Live Nation to make the project a success,” Epstein said in a statement. The Cleveland transaction was financed with a credit facility from GreenLake Real Estate Fund of Pasadena, Calif. Cleveland Construction Inc. is the general contractor and Bialosky Cleveland is the Architect.